Where ETA = ETA to next tick. 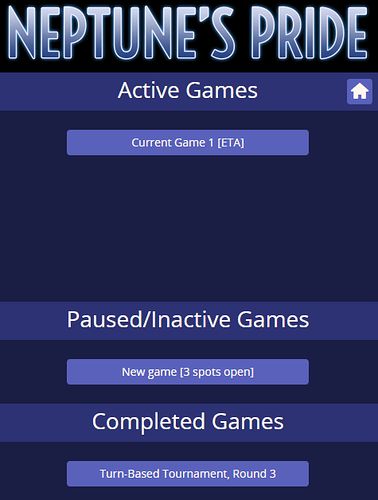 Paused/inactive (obviously renamed to something better) would include games that have yet to start. I know we get notified by e-mail, but for people like me that mostly ignore their e-mail, an inactive games section would be nice as at a glance I could tell what I need to check and which ones haven’t started yet instead of clicking through each because I can’t remember the randomly generated name. I know I’ve seen a request for renaming games, but what about also color-coding to separate Triton and Proteus? or just an icon would help. Good one. I will put this on the list.